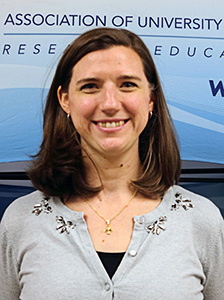 Sarah DeMaio is a program manager for AUCD's Maternal Child Health technical assistance team, working with the Leadership Education in Neurodevelopmental and Related Disabilities (LEND) training programs. Sarah is also the project director for the Professional Fellows Program on Inclusive Disability Employment (PFP-IDE). She provides oversight and leadership to the PFP-IDE which brings 20 mid-career professionals (Fellows) from Kenya, Tanzania, and Uganda, to the US to study with AUCD network members and partners how to implement best practices in advancing inclusive employment for individuals with disabilities. She brings to this role 14 years of experience working with people with disabilities and their families. Immediately before joining the AUCD team, Sarah served as the Executive Director of the Autism Society of Northern Virginia where she developed training materials for family members, service providers, and community groups. She also spearheaded an initiative to offer peer support and leadership development opportunities for autistic adults. Sarah has worked in grassroots advocacy on federal policy at the American Association of People with Disabilities as the moderator for the Justice For All action network. She started her career in special education, working with high school students in Miami, Florida. Sarah earned an MSW from the National Catholic School of Social Service at the Catholic University of American in Washington, DC. During her studies, she conducted research into the effective implementation of person- and family- centered planning as a Ford Fellow. Sarah holds a BA in Anthropology from the University of Pennsylvania and has an older brother with Down syndrome.